Founded in 1998, Teal Sound of Jacksonville, Fla. will celebrate its 10th anniversary during the 2008 Drum Corps International season. To mark the occasion, the organization has launched a new Web site. The new site contains the latest Teal Sound news and information and will expand in the future with various multimedia elements. Teal Sound director Randy Blackburn says that in addition to the Web site, the corps also has released a new 10th anniversary logo. 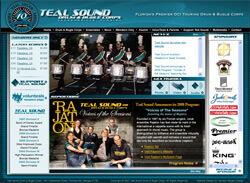 Check it out at TealSound.org.